First off, I wanted to say how absolutely great it was seeing all of you regular JEFbot readers in the comments when I posted the previous strip. It had been SO long since my last comic I knew it was entirely possible that I could post the strip and not get a single response. Anyway, you guys came through with all the enthusiasm and awesomeness you’ve shown in the past and I just wanted you to know it was appreciated. Y’all are seriously THE BEST. 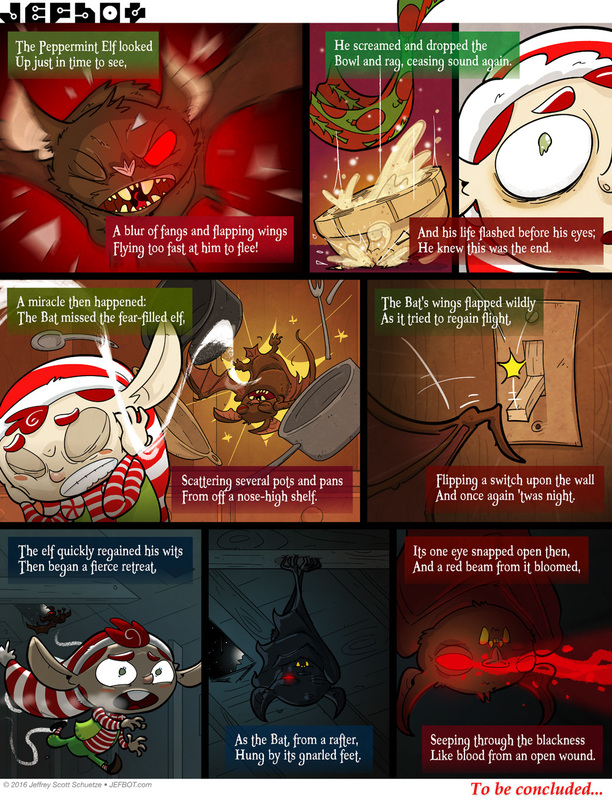 Okay, so it’s a holiday miracle – I was able to get another strip up while we’re still in 2016! With any luck I’ll be posting the next strip – the conclusion of the Peppermint Elf storyline – before things get super busy again. Right now things don’t look too good for P.E., but things rarely go well for those who encounter the Bat, ya know? I sincerely hope you all had a great time celebrating wherever/whatever/whoever you celebrate during this season and I wish you all a Happy New Year!!! I’m looking forward to 2017 even with all the insanity that’s been going on in the world, lately. Let’s all hope for a good one. Also,when can I get this batplushie.They look awesome. HA! yep, the comic continues, IK! hoping i can get another strip out in like, the next week or so before it’s back to the grind. hoping, hoping! 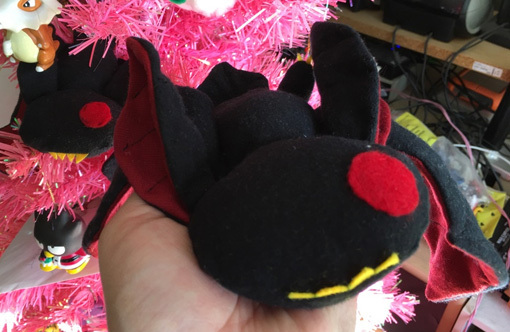 i’d LOVE to do an Abraxas plushie, DJ, but he would take even longer to make than TCB! we’ll see, tho. if i get faster at this sewing thing maybe it’ll seem less daunting. i’ll put you down for a future Abraxas and proto-TCB. 😉 xoxo! It just took me 3 months to get back home and open a po box lol. Sending that email out today! He’s kind of cute in a creepy way. Thank you for the update and have a wonderful new year. heheh. that’s what i’m going for, Kris! a cute/creepy combo. So awesome that you’re back, I remember what a big part you were of my online life (and still are; TheFlamingonator is my go-to username) and I am thrilled to see that you have returned! Well, you may’ve not turned feral, Bot but that bat is as wild as I remember. yep! it would take a LOT to tame the Bat, Anime fan! not sure any mortal could do it – Santa’s the only one who has any kind of sway over him.